A new report from OCLC and WebJunction with ALA and PLA indicates that 33% of people would be willing to donate to their local public library. 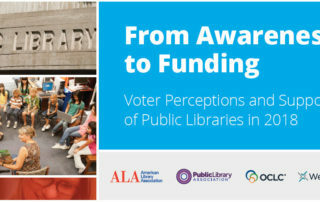 The report, From Awareness to Funding: A Study of Library Support in America, updates 10 year old national data about the willingness of voters to support public library funding. This past fall, 2,000 voters between the ages of 18-69 were surveyed for the report from communities with a population fewer than 300,000. Check out the infographic for a quick overview, but it’s worth your time to look at the full report if you are trying to raise funds for your library or pass a referendum (both available for download from the link above). And for those of you interested in digging deeper, the site also has links to the full data set, survey questions, verbatim responses, and more. The study shows that most people don’t understand how libraries are funded and don’t know that most of their funding is from local sources. Sounds like libraries have some public awareness work to do! The amazing finding is that 61% of voters have either contributed (28%) or are willing to contribute (33%) to fundraising efforts in support of their local library. That number is huge! Libraries sometimes hesitate to start or expand fundraising efforts, but this report is definitive proof that community members are willing to donate — the library just has to ask! But how do you know whom to ask? Check out the report’s detail about supporter segments. Each segment has specific characteristics and motivations for supporting the library. If you are in charge of fundraising for your library, studying these segments will make it easier to identify potential donors. Simply think of people that you think fit into each segment! Your potential donor list can form the basis of your annual development plan. Then, read the rest of the report to see what voters value in libraries. What is your library doing to add value to the community in the areas identified by voters? Boom! There’s the start of your fundraising case statement. Also consider the barriers listed in the report. These are segments you won’t want to spend your time convincing that the library is worthy of a donation. Match your case statement to segments that are already receptive and focus your fundraising efforts. Your success rate will soar because you’ve done your homework!